The Symbios Concept is for the provision of technical consultancy services in the most professional, flexible, and cost-effective manner, achieved through our “virtual global consulting network”. This network, developed during a period of over 25 years professional consultancy activities, provides clients access to senior experts in a range of disciplines spanning space, defence, climate and environment. Symbios has particular expertise in satellite Earth observations, their applications, coordination and the international planning processes concerning the world’s major space agencies and their users. Symbios Project Teams are truly global, comprising consultants and technical experts from the USA, Europe, Japan, South East Asia and Australia as required. In response to specific project requirements, our consulting network can access the very best expertise in industry, academic departments, government agencies, military bodies, and defence research organisations. Our approach ensures levels of relevant expertise and flexibility which can deliver maximum cost-effectiveness for the client. Symbios is capable, dependable, and impartial, and our consultants have a distinguished record of success in major projects. Space Systems: spanning a multitude of studies conducted in the fields of Earth observation satellites, telecommunication satellites, and navigation systems, as well as combinations thereof – such as for vessel tracking systems and fleet management. Earth observation is a particular strength, both in the public and private sectors, and across a diversity of applications. Geographic Information Systems: in particular their applications for use of remotely-sensed and environmental data for both commercial, military, and governmental use. Global Environment: our experience includes technical analysis in support of policy development – for example considering data requirements for treaty verification, PR support for high profile publications and materials, and conference planning and assistance. Symbios has prepared keynote reports for many of the major policy milestone events – including the 1992 Rio Conference, and the 2015 Paris Climate Conference. Defence: much of our work has been conducted for, or in association with, military organisations and is related to defence applications, such as ocean surveillance or high resolution imagery collection for intelligence purposes. The nature of the support offered by Symbios is as varied as our clients' needs. Much of our work follows a traditional consultancy assignment model: we submit a proposal, agree a statement of work, undertake research, and deliver a study report and presentation. If necessary, the entire process can be conducted remotely by e-mail to ensure a fast response and to minimise client costs. Where client needs are less well defined or are dynamically changing, Symbios consultants are accustomed to working as a trusted member of the in-house team, supporting the development of programme ideas and strategy, contributing to internal meetings, and representing the client in external fora. Symbios is also experienced in researching and supporting fact-finding tours, providing a complete service for the client by identifying key collaborators or suppliers, arranging appointments, defining itineraries, and organising logistics. We have provided such packages for numerous corporate and government bodies - in particular for Japanese organisations investigating developments in Europe or USA. promotional and educational material development, such as websites and brochures, including for use at the highest political levels. Symbios was founded by Stephen Ward. Having worked in the UK, Japan, and Australia as a technical and management consultant, he recognised the needs of many clients for more responsive, flexible, and cost-effective consulting solutions. Given the opportunity to work around the globe with a broad range of senior experts in industry, government, and military, he observed that the diverse needs of clients can rarely be best satisfied by static teams which require considerable learning time to tackle each new topic. He undertook to establish a "virtual global consulting network" - The Symbios Concept - which would provide clients access to the very best expertise available, based on a history of focused and relevant experience, and in a flexible and cost-effective manner. 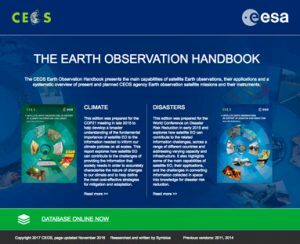 Symbios has published the 2016 update of the EO Handbook and associated database of EO missions, instruments and measurements. The full text and databases of Earth observation satellite missions and instruments and their applications is available on-line at www.eohandbook.com. Copyright 2017 – Symbios Spazio. MERIS image courtesy of ESA. Landsat 5 TM image courtesy of USGS/NASA.